Seeking to live life's moments in the power of God's grace. Please note: Posts on this site may contain affiliate links. For more information, please read my full disclosure statement. You may find this post linked up with my awesome blogging friends at these Blog Parties. I hope you'll check out their blogs! I've already started my countdown to the 2016 NCHE Thrive Homeschool Conference here in my home state of North Carolina! This year's conference will be held June 2-4, 2016 at the Benton Convention Center in Winston-Salem, NC. I've been going to this annual conference for many years now. This year I'll be going as a high school homeschooling mom! I can't believe it - where has all the time gone?! I'm excited to be going again this year as part of the 2016 NCHE Thrive Blogger Team! This will be the third year that I've been on this amazing team of homeschool bloggers who will be keeping you up-to-date on all the exciting details of this year's NCHE Thrive Homeschool Conference! I'll be hosting a giveaway for a FREE Family Registration here on my blog compliments of NCHE. Check back here in April for that giveaway! 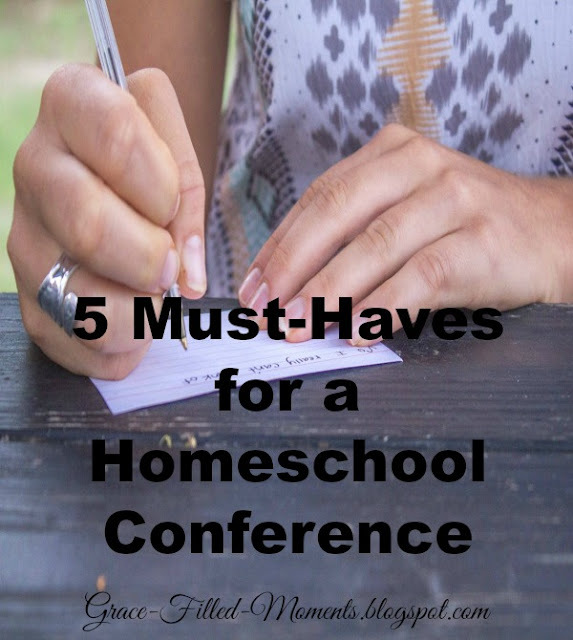 Now on to my list of 5 Must-Haves for a Homeschool Conference! I love to save money (especially during Conference time!) and packing my lunch cooler each day of the Conference is a must for me. This saves me money and saves me from waiting in the long lines at the snack stations. I fill my lunch cooler with bottled water, protein bars, sandwiches, chips, and fruit. The savings I enjoy from bringing my lunch cooler definitely come in handy inside the Vendor Hall! As soon as the schedule hits the NCHE website, I print a copy and start making my game day plan! I really like to take time to read over the speaker intros and the workshop descriptions so that I can prayerfully make my selections of where I will spend my time. Your schedule printout is a must-have that will set you up for a successful Conference experience! Let me tell you that I learned about this Homeschool Conference must-have last year. I have a ton of address labels that I have gotten for free in my mail after giving donations to various organizations. So last year, I grabbed up a bunch of my address labels and stuffed them in my Conference notebook. I used them in the Vendor Hall for the giveaways that I was interested in. Well, imagine my surprise and delight when I received an email that I had won a giveaway and was able to get $200 worth of books for FREE! Address Labels - must have - don't forget I tell ya! I'm combining these two must-haves here. You will be doing a lot of walking - no doubt about it! Make sure you are wearing comfortable shoes so your feet aren't aching by the end of the day. Some of the conference rooms are very cold so be sure to bring along a sweater that you can slip into if needed. I love shopping in Vendor Hall - there I said it!! My Thirty-One zipper tote bag is a must-have for me to carry my purchases in. I'm only homeschooling one child, maybe you are homeschooling more and will need more than one bag. In the past, I've also used those rolling carts, but found them just too bulky to try to get around with inside Vendor Hall. If my tote bag gets full, I can just run to the parking garage and unload my purchases into my van. There you have it! My 5 Must-Haves for a Homeschool Conference! What are some of your must-haves when you go to your state's Homeschool Conference? Feel free to leave me a comment below! Don't forget to check back here in April for my giveaway of one FREE Family Registration to 2016 NCHE Thrive Homeschool Conference. Follow me on Facebook so you don't miss that post! Hello, friends! I'm Laurie Messer - a daughter of the One True God, disciple of Jesus, wife to a wonderful husband, mother to 2 beautiful children and one waiting for us in heaven, and a grandma to one grandson. My desire is to be filled with the empowering presence of God which enables me to be who He created me to be and to do what He has called me to do. God answers this prayer by giving me Grace-Filled-Moments in my journey called "life". I'm so glad you are here!